So I wanted to share the title track of their album Blessed. It’s called Love Recipe (not to be confused with Gummy’s Love Recipe). I have always been a fan of videos like this. I loved it since I saw it the first time. I like that they made the video in a restaurant and in a sweet shop/deli. I love the different frames and the camera angles. It was shot perfectly. I also love that they didn’t focus only on food but they also showed people in love, not just the romantic kind but all kinds of love. It’s very artistic and deep. This is my kind of video and I’m glad Clazziquai made something different from all the other Kpop vids we are used to seeing. I have been waiting a long time for their comeback! 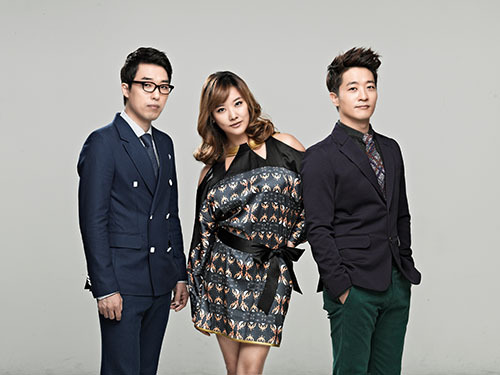 I have always been a Clazziquai fan since I heard “She Is” and “Be My Love” from the OST of My Lovely Samsoon. And I have not stopped liking them because their music is very different from traditional Kpop. If you have listened to their previous albums, you would realize that this song is reminiscent of their first album. Though they are known for releasing electronica songs, Clazziquai has done a few songs of the same genre as Love Recipe. I kind of like them singing this jazzy/bossanova sound. As always, Clazziquai is not afraid to experiment with their music and they always release tracks that are fresh and original. Alex and Horan’s voice as usual go perfect together. Actually to me their blending is probably one of the best in the industry. It’s PERFECT!!!! This group has long been a favorite of mine and I could say a lot of praises about them, but I have to write this blog so I’ll sop here. Final Verdict: They amazed me with another song again! I love this song and I can listen to it the whole day!!! I love them!! Soljikhage malhamyeon dalkomhan geon sireosseo. Honestly speaking, I didn’t like sweet things. 솔직하게 말하면 달콤한 건 싫었어. **note: I had to edit some parts of the romanized words (example, i use shigani instead of sigani for 시간이) because i have a way of writing my romanization, but most of it was by AlphaBunny..
Yay! it’s a new song with Alex and Horan singing. It’s called Maybe, Maybe (but i think it’s better if they translated it Perhaps, it has a more dramatic effect). I am so excited hearing them together again!!! Bring back Clazziquai Project!!!! Anyway, this song was actually composed and written for a show called Music and Lyrics. For this particular episode, John Park and actress Park Jin Hee team up to make a song.. and this is the song they made.. and i am so happy they let Alex and Horan sing it!!! For those who do not know, they were part of Clazziquai Project. I think their voices match really well and they sound very good together. And that I probably why I love them so much! I wish they had more songs. Looking forward to more from Alex and Horan. Fluxus music.. please!!!!! I’m going a bit on a backtrack mode with the video that I am sharing. Actually this is the first time I saw this video, but this is from a song from Clazziquai way back 2007/2008. Some of you may be familiar with the song, but the video is different as it is the Studio Version of the MV for Lover Boy. Lover Boy was their single from the album Love Child of the Century. As you may know this is the album which has the song Romeo and Juliet (the one that Alex and Shinae sang in We Got Married). And I have to say that this is to date my favorite Clazziquai album! I like this video compared to the original one.. The studio version is just plain hilarious… but in a good way. This was before Alex’s stint on We Got Married. I kind of liked this Alex here.. as after being on the show he kind of reverted to the romantic guy Alex… It’s nice to see the fun and cool Alex sometimes! And Horan.. I simply love her!!!! I am so missing them and I want them to make an album again. They were the first Korean group that I really liked.. Long before I liked Kpop idols. I wish t hey would make more music.. the Clazziquai project music.. its been almost 3 years since they last released an album. And because I miss them.. here is a bonus video of them singing Love Mode and Come To Me sometime in 2009. These are really old (well not 10 years ago but more like 4 or 5 years ago, but in the Kpop world that’s really old already) performances by Clazziquai. I’m lucky to have found them on youtube! Actually.. Clazziquai is one of my favorite groups in Kpop.. but I’m not sure if you could actually call their songs pop because it’s more on the electronic sound. I love this genre but I haven’t seen much of it in the Korean music industry.. just a handful of artists does this and most of them are either underrated or a playing their music underground. Anyway these are a few of them.. If you’ve see My Name is Kim Sam Soon, you would know this song. This is played over and over again in the drama. And this song is what actually made Clazziquai popular in the mainstream Kpop world. This is the english version of the song. Yes, they do have several English versions of their song, which absolutely thrilled me during the start of my Kpop addiction. Though their English wasn’t that good, but its audible and understandable except for a few words. I have to say this is my favorite Clazziquai song! I just love the electronic stuff DJ Clazzi did on this song. The original version has Tablo (of Epik High who is making his comeback soon! hooray!!) doing the rap.. in straight English! They do have a Japanese version of this one too where they sing the whole song in English while the rap is done in Japanese by M-Flo (you should hear his songs..). Love mode gets to me totally because of the Western/European sound which I love that this group is doing even before it became popular in Korea.. DJ Clazzi is a genius! For one who watched We Got Married back when the variety program started, I’m sure you would know this song because it was what Shinae and Alex sung. This couple for me were too good to be true.. kk too sweet. But I think we got married that time was more believable compared to the We Got Married now. There was that certain sweetness that seemed surreal among the couples back them. I think maybe they were better actors! kk Kidding.. actually when I watch we got married now, it doesn’t have the same vibe as it did.. I mean probably the last that I liked were Jo Kwon and Ga In. Yonghwa and Seohyun almost did it for me, but sometimes they were just a bit too stiff.. Anyway.. about this song, this song is too sweet and I like the acoustic vibe of the song, paired with the rap part. I wish they would produce more songs like this in the Korean music industry.. I really really miss Clazziquai!! I’ve been pretty caught up with a lot of things to do so there wasn’t any update on the blog. Not only on my blog, haven’t really watched any of the variety shows.. sigh… so much catching up to do..
Ok.. so what happened to Alex‘s hair??? Well he looks younger with that do though.. so we’ll forgive him! But Horan looks stunning in this video! I was very happy when I read that they were performing on Sketchbook. Before my idol fanaticism, there was Clazziquai.. and there will always be Clazziquai! They are actually the first Korean group that I really, truly like!I absolutely love their music… Thank God for the drama Kim Sam Soon for introducing them to me. Since then I haven’t stopped admiring their music. Their music is different and their beats are just right for me. But they haven’t had a new album out though (even though Horan and Alex has had some solo projects). I think their last one was in 2009 if I am not mistaken. Can they like come back now with a new album? Wish they would release something new soon (DJ Clazzi please… ^_^).